Republican Alphonzo Bell at his campaign headquarters in Little Tokyo, Los Angeles, California, March 15, 1969. Bell, a smiling Caucasian man in suit, stands in street at far right holding a bumper sticker, "Alphonzo Bell", next to a Japanese man in suit and eyeglasses on sidewalk holding a bumper sticker. Woman in checkered suit bends down to place a bumper sticker on a car in center. Another man in suit and eyeglasses stands on sidewalk behind car. Sign on building in background, "Li'l Tokyo Headquarters, Alphonzo Bell for Mayor". 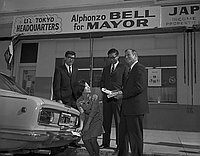 Typed on original negative envelope: Alphonzo Bell for Mayor -- Little Tokyo Headquarters.